Pears provide a variety of the nutrients necessary to lead a healthy lifestyle. Pears are an excellent source of fiber, with each medium-sized fruit providing about 24% of the Daily Value. Recent research supported by Pear Bureau Northwest indicates that fresh pear consumers had a better nutrition profile when compared with consumers who didn’t eat fresh pears. 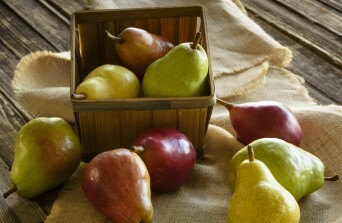 For example, pear consumers ate more dietary fiber, vitamin C, copper, magnesium, and potassium. Fresh pear consumers also had lower intakes of added sugars, total fat, monounsaturated fat, and saturated fat (1). Fiber is an important preventive agent against many chronic diseases, and it plays a beneficial role in glucose metabolism and diabetes management (2). Pears have vitamin C, an important antioxidant necessary for bone and tissue health (3), and prevention of cardiovascular disease and various cancers (4). Pears are also a natural source of other antioxidants, which, according to the Academy of Nutrition and Dietetics, are important in the prevention of cardiovascular disease, cancer and diabetes, and may improve immune function and lower risk for infection (5). People who eat lots of anthocyanin-rich fruits, such as pears, have a lower risk of developing type 2 diabetes, according to a Harvard study which included about 200,000 men and women (6). Also, pears, like most fruits, are a fat-free, nutrient-dense food that can help fill you up and keep you satisfied. According to the 2010 Dietary Guidelines for Americans, these benefits may aid in weight loss and weight management (7). Learn why pears are a sweet you can eat. *Per medium sized pear weighing 166g. Anderson JW, Randles KM, Kendall CW, et al. : Carbohydrate and fiber recommendations for individuals with diabetes: A quantitative assessment and meta-analysis of the evidence. J Am Coll Nutr 23:5-17, 2004. Available online here. Oregon State University, Bone Health. Available online here. American Heart Association, Diet and Lifestyle Recommendations. Available online here. Academy of Nutrition and Dietetics, Antioxidants—Protecting Healthy Cells. Available online here. USDA 2010 Dietary Guidelines for Americans, page 28. Available online here.